Skypods are an innovative and versatile roof lantern system that can be used on both flat and pitched roofs; they offer a unique combination of contemporary home appearance with unmatched quality that offers a new and exciting interior décor experience. Skypods are used to bring out stylish and natural lighting in any home, as adequate natural lighting enriches the overall aspect of a room and heightens dull spaces to offer a brighter and lighter outlook. This explains why top world architects are embracing the benefitting factors of the Skypod. Why Invest in Skypod Skylights? 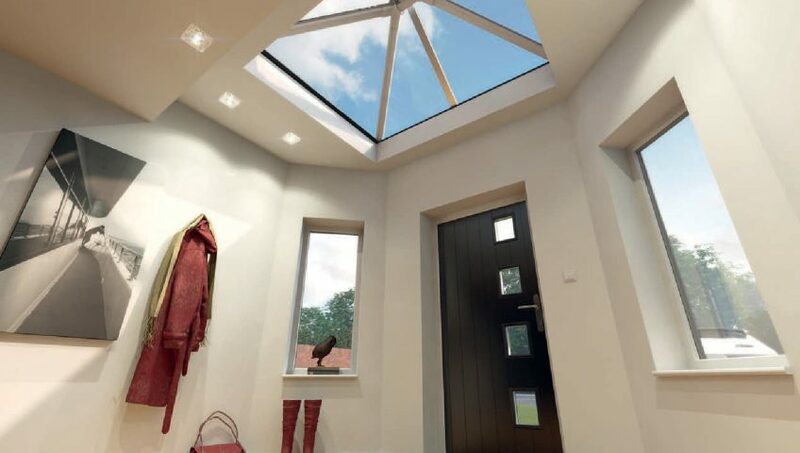 At Premier Roof Systems, we do not just manufacture skypods to provide lighting in a room; we focus on making a stunning skylight feature that appeals from the inside and outside as well. Apart from the two bar and three bar skypod designs, we are always ready to manufacture a roof lantern that fits your project specifications whether big, small or uniquely shaped. Apart from offering a wide range of designs, Premier Roof Systems offers skypods in a variety of colours. This allows clients to choose a colour that suits their interior décor, personal style, taste, and preferences or one that complements their entire property. However to keep the interior bright, most roof lanterns come with a white internal finish. But, the external colour choices range from golden oak, grey, rosewood, and white among others that beautifully match or contrast with the doors and windows to offer a stylish look. All skypod roof lanterns from Premier Roof Systems are designed to offer improved energy efficiency. The skypods offer U-Values of around 1.0 for a strikingly lit space with an open feel that you can enjoy all year round despite the harsh weather changes. We understand that clients appreciate fast turnarounds. Therefore, we pre-assemble the skypods to facilitate easy on site fitting. Our skylights installation expert will visit your property to examine the roof and take measurements for your preferred skypod size. The skypod is then manufactured or assembled. So once the roof area is prepared, the skylight is fitted quickly and easily. If you want the wow factor in your home, you just need to choose a skypod with the right features. You can go for a small yet perfectly designed roof lantern or a large gazebo style roof lantern that maximizes natural lighting. Additionally, you can opt for rectangular or square shaped roof lanterns and match the frames with your favourite colour. If you are not interested in glass, you can choose aqua, bronze, blue or neutral. Skypods boot lighting in your home whether you choose the three bar design or the two bar design. The three bar design is ideal for a big room and is fitted on a large flat roof surface. The two bar design is used in most homes that do not require too much additional lighting. Skypods open up rooms or homes to direct sunlight during the day and sinning stars at night. How much will the skypod skylight installation cost? Unlike the traditional aluminium skylights, skypods skylights are less expensive, outstanding and can match with most PVCu doors and windows. But, sometimes home owners overlook cost to achieve a permanent natural lighting solution. Can skypods skylights be fitted to pre-existing flat roofs? Skylights can be retro-fitted to any strong flat roof to deliver an incredible and spectacular transformation. But, your roof must be strong enough to hold a new load. Alternatively, your skylight installer will recommend strengthening the roof in case the original construction is not favourable for skylights installation. This depends on where the skylight will be installed. If it is being installed on your home extension, the size and location may be of particular concern. For instance, single storey rear extensions are permitted so long as they do not extend by more than 3 meters if attached to the main house and by 4 meters when detached from the main house. How big should the skylight be? There is no standard skylight size because everyone has unique taste and preferences. However, you do not need a big skylight despite the size of your house. For example, a skypod skylight of 2m by 1.5 will deliver adequate light and ambience to a medium sized room. Also, the number of windows and amount of natural light you receive should determine the size of skylight you need. What type of glass will be used? Triple glazed units and Low E glass are commonly used because they have a solar reflective coating that reflects heat during summer and a transparent metal oxide film that traps heat during winter. So, they are thermally efficient and offer unparalleled functionality all year round. Why Work with Premier Roof Systems? Premier Roof Systems offers unmatched skypod skylights installation experience gained from working with a wide range of domestic and industrial clients. So, despite the nature of your roof, you are guaranteed to get a well fitted and durable skylight. Our dedicated skypod manufacturing team ensures that we offer high quality skypod skylights within the shortest time possible and at the best market prices.